511 Tactical 569346941 SZ Responder BLS 2000 Bag (56934) FREE SHIPPING! 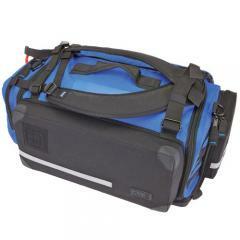 Tough, dependable and optimized for the needs of first responders, the Responders BLS 2000 Bag from 5.11 Tactical is the ultimate duty bag for any EMS professional. Built to maximize every precious second possible, the bag features reinforced garage door style openings to allow for rapid oxygen tank and item access. Removable organizers and padded tank holders further add to the bag's tactical functionality by allowing users to quickly pull out, view and access vital equipment. YKK® self-repairing nylon coil zippers and glove-friendly zipper pulls prevent awkward fumbling and wasted time when lives are on the line. Fully adjustable, removable backpack straps offer versatile and comfortable carry options so the BLS 2000 is never left behind. ©2002-2019 CopsPlus.com: 511 Tactical 569346941 SZ Responder BLS 2000 Bag (56934) FREE SHIPPING!